Now, I have never gone into a business thinking abusing their staff WOULD be tolerated, and I doubt many people do. Having worked with the public in a front line capacity for many years at veterinary clinics and in the aviation industry I have dealt with difficult customers, patrons and individuals who just landed inside our doors for whatever reason. Not once, though, did it ever occur to us to put up this sort of sign, because the message is faulty on many levels. And now, in 2014, I am beginning to avoid stores and businesses where it is displayed, because to me it says something about the nature of the business. To start, I believe these signs are "preaching to the choir". After having worked with the public I know that those most likely to be truly abusive often have mental health issues or anger management issues, or may be intoxicated. 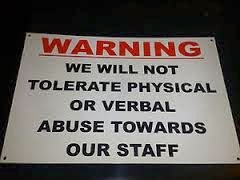 The behaviour of those individuals is unlikely to be changed by a sign, and those who do read the sign and nod their heads are not the ones likely to exhibit signs of abusing staff. The effectiveness of the signs is very suspect to me, which leads me to question a few things. Who determines what is "abusive"? Is the customer who is angry about their faulty toaster abusive if they express their anger and disappointment? Is it when someone uses profanity? Is it threats? Who and where is the line drawn? And doesn't it make more sense to evaluate every situation on a case by case basis and not with a universal sign that poorly-defined "abuse" will not be tolerated? And how often do these abusive incidents REALLY occur? Is it often enough to truly need a sign? What is this message REALLY saying? Remember the good old days when the customer was always right (even when they were wrong) and you as a business or front line person bent over backwards to make them happy? Now we put up signs so if we choose we can take difficult customers and boot them onto the street, never resolving or addressing their problems. We can simply say they are "abusive" and it's become the "olly-olly-oxen-free" of customer service, because then we can stop listening to their concerns, which might be real and genuine and if we can cut through the anger we can find resolution. One of my greatest achievements when dealing with the public was the ability to turn angry people into good customers. When I worked in aviation we had one passenger who flew with us often, and when his name appeared on a flight manifest I knew the flight was doomed to experience major delays or cancellation due to weather or mechanics, because it was just the kind of luck this guy had. Added to that was the fact that he was by nature an angry person, and when he walked to the airline counter he was ready for battle every time. Could he be considered abusive? Probably, and we could have banned him from our airline, I suppose. But I took a different tactic. I started a campaign to win him over. The next time he arrived at the airport his flight was delayed by five hours. I knew he would be seething with rage, and I was ready. We were a small rural airport, half an hour from town, and I knew he always took a taxi out, meaning going back into town to wait would cost another taxi ride which added to his fury. That fateful day he approached the counter, and I held up one hand and said "Your flight has been delayed until 5 pm", and I could see the rage building in his eyes. Then I held up my other hand, from which was dangling my car keys, and I said "These are the keys to my car. It's the green van out front. Take it into town, get some lunch, relax, and be back in four hours," and smiled. The look on his face was pure and utter shock. His rage faltered, and I could see confusion in his eyes. He held out his hand and I dropped the keys into it. He looked at me and said "thank you" and quietly exited the airport, still trying to sort out what had just happened. He returned four hours later, took me aside, and told me that no one had ever tried so hard to make him happy, and no one had ever made him feel like he mattered. After that day he was one of our calmest passengers. I had changed the message and the dialogue. He still ran into many delayed and cancelled flights, but he knew that he mattered to us and to me, and that he was not just a number or a cog in the machine. It was a customer service triumph, and perhaps the one for which I feel the most pride over the course of many years of dealing with the public. In my years in customer service I have been sworn at, had things thrown at me, and had coffee poured in my lap. I have dealt with nice people, timid people, angry people, aggressive people and yes, abusive people. Every single situation needed to be handled differently, and some resulted in people being asked to leave, shown the door and, in one memorable incident, tossed out by my boss who overheard a threat made to me shortly after the shootings at Ecole Polytechnique in Quebec. Not once though did I think a sign would have changed these incidents or prevented them. A sign would provide only false security, and the real trouble was what the sign was really saying. Thank you for treating our staff with respect. I would say that last sign is the most important. One single word, welcoming everyone. No need to explain that abuse will not be tolerated, as we all know it isn't and won't be, but instead welcoming everyone to our establishment and assuming they will behave well. We need to remove the negative words. We need to change the dialogue. We need to start from a place where everyone is equal and welcomed and if they misbehave then we deal with it on an individual basis. We need to take down the signs, Fort McMurray. Business Communication 101 - do not use negative words. Even to break bad news. I tend to see signs of this nature in government buildings which I find quite telling. Being born in ymm I have seen some of the most evil entitled people yell and even throw items at the service staff at fast food restaurants. It's part of the reason I moved next to the environmental destruction that goes on north of the city. I've never seen anything like it on a per capita basis. Per-capita, the people in ymm are just awful, entitled hillbillies. The worst part? THEY HAVE NO CLUE. I'm proud to be able to travel and it feels great to be an ambassador of the TRUTH when people ask me where I'm from. I'm much happier thinking for myself instead of shilling for oil, getting in childish debates on twitter or bragging about my shoe collection while the less fortunate starve. haha Brandon tends to think that since he travels he's smarter then everyone else. He thinks he speaks the truth but the fact is he's a Fort Mac embarrassment.